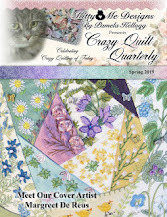 MAGPIE'S MUMBLINGS: A cover - of the crazy quilt sort! Thank you - it was a fun project. I wanted to see if I could combine Cathedral Windows and crazy quilt and it turns out I can! Thank you Christine - it was a challenge that I enjoyed. I wanted to see if I could combine the two styles and I think it worked okay. The zipper link is fantastic. The jewelry there is so Steampunk. The zipper link had lots of great ideas for sure - some I had seen before but there were a number that were new to me. Fun to know that we can use those funky colored zippers in our stash and make something fun! Thanks Sherry! The pillow is just one more thing to have to take off (and return to) our bed every day, but oh well. At least it moved some stash from the sewing room into another room! That's a beautiful pillow, Mary Anne. The details in the center are lovely. It would be fun to study in person. Crazy quilting is so mesmerizing. Thanks Becki - just one more thing to have on our bed to have to deal with every day, but at least the 'makings' are now out of my sewing room. Sort of a win! How resourceful you are! Beautiful work as always. About the slippers, I've made many pairs of Aunt Maggie's slippers, also garter stitch. They don't slip because the garter stitch ribs run across the sole, and act like a tread. They're pretty skidproof. I think this design is likely to do likewise. That's why garter is the best stitch for this use. Thanks for the info Liz - I never would have thought of garter stitch being non-skid, so it's good to know. You have created another winner with your beautiful cushion. It's fabulous. Just another thing to clutter up our bed - but at least the raw materials are no longer in my sewing room! I don't suppose you would ever not enjoy some crazy quilting. This is such a pretty pillow cover with all the sweet embellishments. Those knitted slippers are very cool and thank you for the flower link. I will add them to my 'kit' bag. 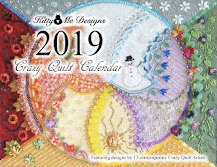 No, I don't see myself ever giving up crazy quilting, but I have to say that I've noticed a downward swing in interest throughout the internet. Many people are switching over to cross stitch (and even some macrame) is seems. Beautiful pillow! Great links. The zipper one is quite innovative.Thanks. I was intrigued by several of the zipper ideas, but alas there are no such zippers in my stash. Too bad! Of course you just finished this! Do you ever sleep woman!? You have such a talent for creating one-of-a-kind works of art with fabric. I love this pillow and all of the pretty details. Love that quilted Valentine table runner link! Well....sleep is a touchy subject in my household I must admit. For some reason it's something that I sadly lack, between my not being able to sleep and a DH that likes to snore! Solitaire on my tablet in the middle of the night happens a whole lot more than I'd like. Thank you - I do too! It was a fun creation.